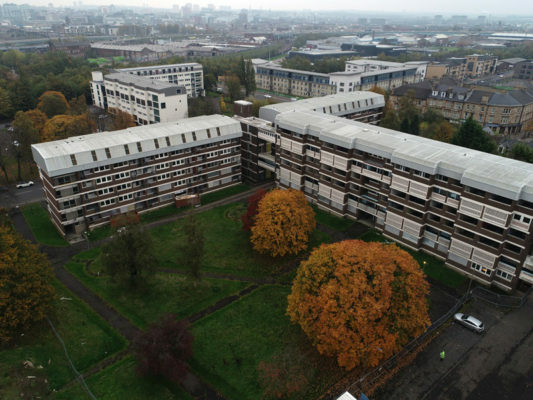 Central Demolition Limited were awarded the contract for the demolition of 4nr 15 storey concrete framed residential tower blocks in Dumbarton for West Dunbartonshire Council. This was undoubtedly one of the most challenging projects we have undertaken in recent years. The asbestos removal works at this site are some of the most complex works we have ever undertaken. A big difficulty ensued from the finding that notifiable asbestos was clad within the outside faces of the 4 buildings. A lot of careful planning was therefore required, and it was agreed that the works to the external elevations of the blocks of flats would be facilitated via the use of enviro-wrapped scaffold and mast climbers to access all 15 floor levels safely. There was also a major internal asbestos removal operation to remove significant quantities of licensed and non-licensed materials. An issue which arose was the pressure of local action groups, who were rightly very vocal regarding their concerns over the asbestos content of the buildings, especially in light of significant asbestos findings within other demolished structures in the area. 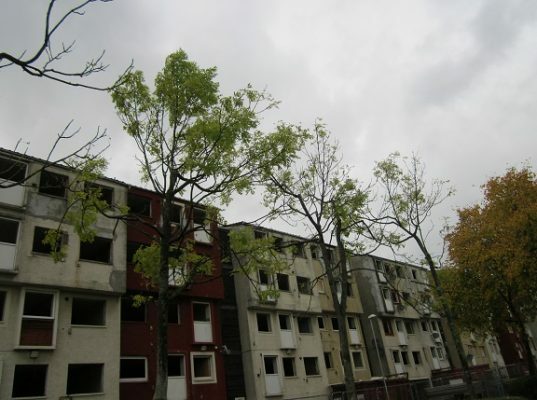 Due to the significant quantity of asbestos found when the flats were comprehensively surveyed, we worked closely with clients West Dunbartonshire Council, the HSE and the local action groups to reach the shared goal of the 4 blocks of flats being demolished safely with no fibre release into the atmosphere. Prior to the demolition of each of the 4 buildings, safe exclusions zones were set up and the structures were soft stripped of all fixtures and fittings in preparation for machines taking down the buildings. Each building was demolished, further to all asbestos being safely removed, by Super High Reach Machine in sequence, maximising our efficiency. 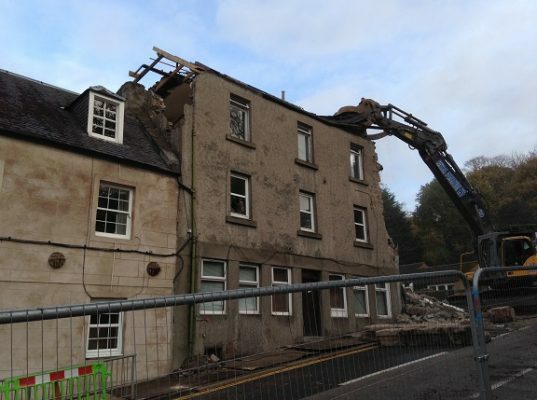 It was originally planned that 2 of the buildings would be demolished by explosive demolition, however the methodology was revisited and revised further to the discovery of the additional asbestos and after extensive consultations with our client and the HSE. Despite the vast size of the site, we ensured that we recycled all soft strip materials and demolition arisings as far as possible. All concrete etc. arising from the works was recycled on-site into 6F2 granular material. There was a significant quantity of 6F2 material produced – approximately 80,000 tonnes. Our efforts on site led to us achieving an impressive overall recycling rate of approximately 98%. We faced major challenges and risks throughout the project, but these were all managed successfully. The local community centre was a mere 15m away from one of the buildings being demolished, but through comprehensive health and safety plans and regular communications we mitigated all risks. There was also a primary school and residential housing in close proximity, and our health and safety plans took this into consideration. 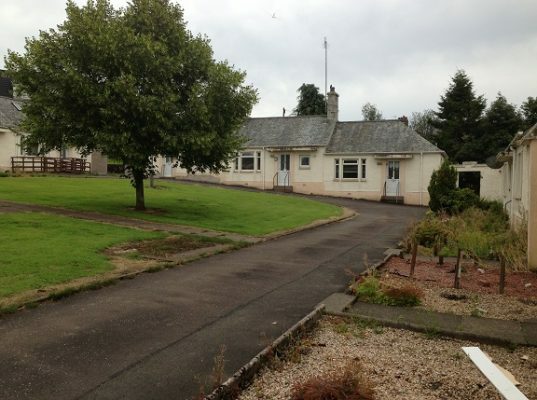 The asbestos removal works mentioned above were obviously our most significant challenge. 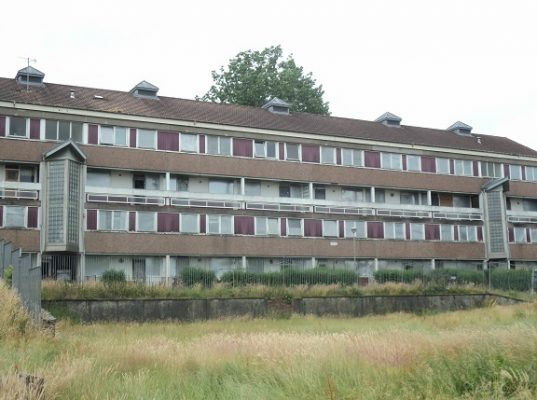 The external asbestos was not discovered during the client’s asbestos survey, and so safe systems of removal had to be configured which included in-depth discussions with the HSE. These revised working practices were comprehensively planned so as to mitigate a major risk being faced – the external asbestos on the structure led to our operatives working at heights of 50m above ground level. To ensure safe working at height, fully enclosed scaffolds were erected. Both our asbestos and demolition teams done a fantastic job, and demonstrated the high level of talent within Central’s workforce. Norrie Grant, our Demolition Supervisor, was highly commended and his excellent management of this project has led to him being chosen to lead on another significant site. Despite the complexity of the works and the multitude of challenges presented to us, the project was completed safely and within the agreed timescale. The works came in above budget, however additional costs were unavoidable due to the discovery of the external packers. Prior to our asbestos works commencing, the additional costs were negotiated and satisfactorily agreed with our client. Our client was satisfied with our works and provided good feedback.